Hardcover, 8 x 9.5 in. / 204 pgs / 300 color. Designer and author David Carson pronounced the “End of Print” in response to the virtual world's ever-increasing influence on design. 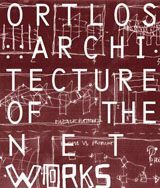 And if Ortlos: Architecture of the Networks is any indication, it seems that the group will soon pronounce the “End of Architecture” (as we know it). Ortlos--which means “placeless” in German--is a virtual office (or platform) that deals with architectural topics, urban planning issues and interface design. Its members include a global network of architects, web designers, media theorists, net artists and IT specialists, all of whom are experts in their various fields and professions, and all of whom can collaborate on online projects that are either of interest to them, or specific to their locales. “Ortlos” also describes the virtual office's basic working method: not being dependent on a specific physical space to work, but located instead in networks and anywhere where an Internet connection is provided. The firm aims to generate advanced instruments for architectural and urban design, a sort of platform, a creative pool supported with information and databases: It is a virtual office that never sleeps. 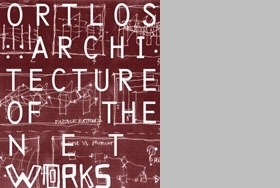 Designed and written by the firm's “partners,” Architecture of the Networks documents Ortlos' projects from 2000 to 2003. Each of the 12 projects shown and explained here by Ortlos incorporates various approaches to the fields of architecture, urban planning, media theory, product design, installation art and interface design. 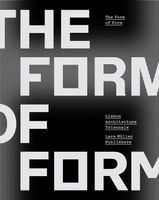 This new and fresh way of addressing contemporary architecture also includes a research project about network collaborations, and Carson's interpretation of Ortlos' architectural work through the specific language of graphic design. FORMAT: Hardcover, 8 x 9.5 in. / 204 pgs / 300 color.